In your childhood, you may have remembered the daily occurrence of freshly mopped floors. 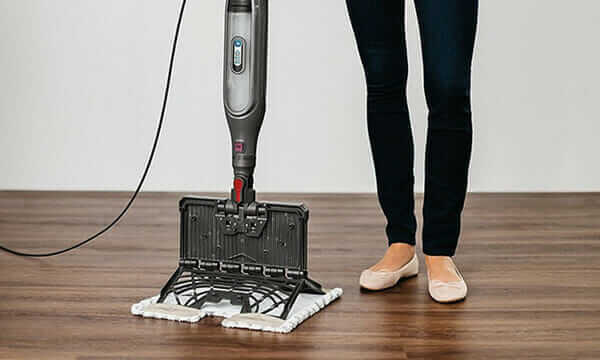 If you’re looking to meet that goal in your own eat-in kitchen, or at least keep your feet from sticking unpleasantly to the tile, mopping is certainly the way to go. We’re here to help you become the most effective mopper possible by providing tips, steps and help so that you know exactly what you need to do! The good news is, mopping tends to be a pretty straightforward chore unless you have a lot of space to cover or a unique type of flooring. Depending on the size of your floor, you could be done in a matter of minutes! A broom with a dust pan, or a vacuum that works on hard surfaces. An open sink or mop bucket. A second available sink or bucket. Gather together all of the items listed above. Make sure that you’re careful with the cleaner and mop you choose, as different flooring types will have different needs. It’s also important to avoid a cleaner that might be too harsh and cause damage to your floor type. You can also try out a home made mopping solution! It’s also ideal that you have two sinks or mop buckets, or a combination of the two. You’ll want one for the water and cleaner, and another to store the mop while it’s drying. You can get away with trying to use just one, but it can get a little tricky! 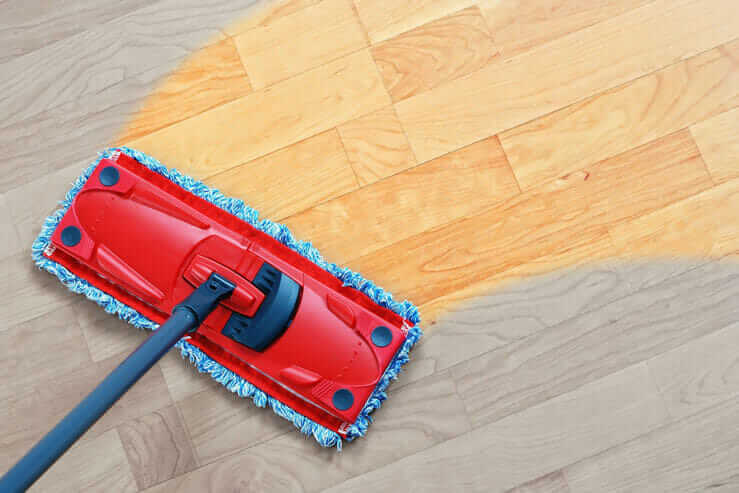 In addition, it’s wise to make sure you have a way to clean surface debris off the flooring easily before you get started on the mopping. Finally, a rag or towel to help with reaching into the corners and edges is a great tool to have for a perfectly clean floor. Before you get started on your mopping, you’ll want to make sure the floor is ready to be mopped. Sweeping or vacuuming the floor before anything else is a great idea. A hardwood floor vacuum is a good choice for that. This just makes certain that there isn’t any debris on the floor that can get stuck to the mop or make more of a mess. If you want to give any particularly dirty areas a quick spot-scrub, that’s also a great idea. It can really make getting the entire floor clean easier once you get started on mopping the floor. Ultimately, it’s up to you whether you choose to use a mop bucket for mopping or a sink. Everyone is going to have their own preferences depending on their unique situation. There are certainly benefits to both options, making them each well worth it. A bucket can be a fantastic option because you can fill it up with your water and cleaner and carry it along to wherever you’re cleaning. This is an ideal option for larger areas because you won’t have to return to the sink every time you want a fresh mop head for the next bit of cleaning. On the other hand, a sink can be perfect for a smaller kitchen. It’s an option that is easy to clean out and refill with clean water as needed and you won’t need to worry about purchasing more cleaning equipment to get your mopping done. Just hot water, cleaner and your sink! Every so often, you’ll want to make sure to freshen up the mop by dunking it into your cleaner-filled water and rinsing it out. Otherwise, you may just end up pushing dirty water around your floor! If you need to, make sure to refresh the water you’re using too. When you wring out the mop, you’ll want to make sure to get most of the water out of it, just leaving it damp. Too much water can result in a water buildup on your floor that is unpleasant, and could potentially result in damage to some floor types. In many cases, this can require ringing out the mop by hand, however there are some self wringing mops that can make the process a little easier. If you want to get really fancy, you can even use a mop bucket with a wringer built in to make everything as simple as possible. An important concept to keep in mind once you start mopping is making sure that your feet stay on the dirty floor as much as possible. The wetness on the floor can pick up dirt from your shoes or feet, damaging the progress you’ve already made. Depending on the type of mop you’re using, it’s also important to use a technique that matches the mop. For example, if you’re using a rag mop it’s most efficient to work in figure eights for the best results. Meanwhile, sponge mops work best in straight lines. In addition, you’re likely to run into some spots that are dirtier than others. At this point, you’ll have to add more pressure to the mop and scrub faster, creating the friction to help get the substance off a smooth floor. Then, keep at it until the debris is up, or you can choose to let it rest for a little bit with some of the cleaner water on it and come back. Another aspect to keep in mind is rinsing out your mop. You’ll want to keep it clean, otherwise it’s not really going to be cleaning the floor very well! This is also where the extra sink or bucket can come into play. Rinse it off in that space in between sections as well as when you’re finished. Making sure your tools are clean goes a long way toward ensuring a clean floor. A clean mop will also likely last longer, so you’ll be able to mop frequently without worrying. Once you’ve finished, it’s important to clean up your tools before you put them away. Rinse off the mop as well as the bucket you’re using before placing them back into a closet. It’s also a good idea to let them dry fully before putting them away, to avoid any issues with mold. If you’ve been using a sink instead of a bucket, make sure to clean it out thoroughly with soap so that it’s ready for normal use. You’ll also want to give the floor some time to dry before walking around in the kitchen again, or you may end up with wet socks! 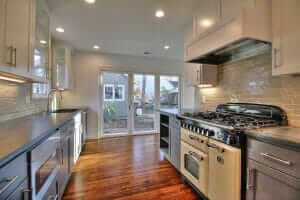 Take the kind of floor you have into consideration when choosing a mop and floor cleaner. Some cleaners can be too rough for certain kinds of floor types, and some mops may scratch up the flooring. Don’t forget to clean up your tools and replace your water whenever needed. Otherwise you’ll just be pushing dirty water around. Make sure to sweep or vacuum the floor before you mop, to pick up any surface debris. Let the floor dry before walking on it again after cleaning. Ensure you have all the tools you need before you get going!